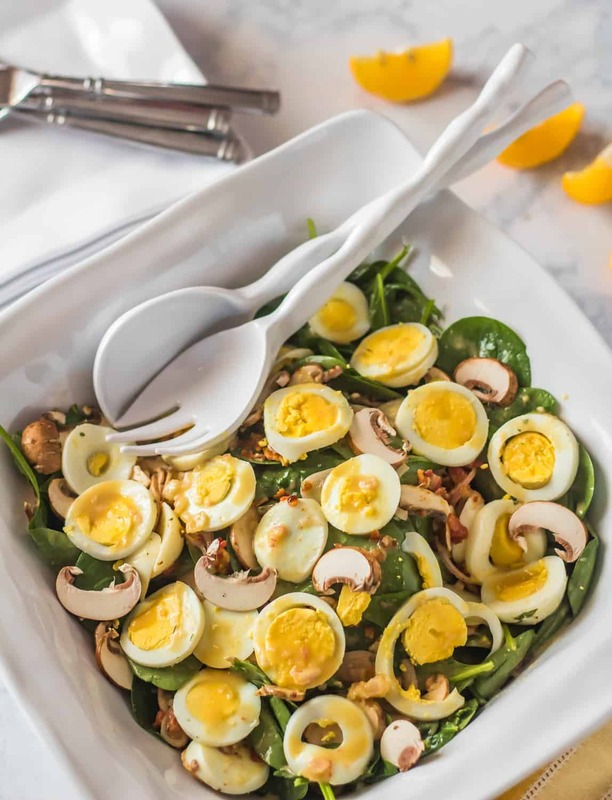 It’s a classic, but it’s not bland or boring… A Classic Spinach Salad with Honey Dijon Vinaigrette is nutrient and flavor packed with umami mushrooms, smoky bacon, and protein-rich hard-cooked egg. It’s going to be perfect alongside that leg of lamb (or honey baked ham) on your #SundaySupper table! We’ve been a #SundaySupper family from day one… long before social media and this movement. Set the technology (aka phones) aside, and enjoy cooking and eating a meal together. I’m joining other talented food bloggers for this very special Easter event to bring you easy side dishes for your Easter table. You’re sure to find a few to round out your holiday menu, so don’t miss scrolling all the way to the bottom to check them out! As I mentioned, Sundays and suppers were always a “thing” at Andersen casa. When our 4 boys were young, they were always in the kitchen with me. As they entered adult years, we fondly referred to “cigar Sunday” and “Sunday funday” – our nickname for family time spent planning and executing a special menu, then eating, chatting, and playing board games. This continued until our family became scattered to the “four winds” (south Texas, New Mexico, Arizona, Minnesota, and North Carolina). I do not exaggerate in saying it was the “glue” that held our family together, and still, our fondest memories involve time around the table. My work flow goes like this: Put the eggs on to boil. Cook the bacon until crisp. Make the Honey Dijon Vinaigrette. Slice and chop the remaining ingredients, then assemble. THAT. IS. ALL. Mark my words, your friends and family will love this Classic Spinach Salad with whatever marvelous main dish you choose! As Christ-followers, Easter is a major celebration. As I mentioned, our family is scattered, but we still find the time to enjoy an amazing meal around the table… After our Easter service at St. John’s Episcopal, Mark and I have the privilege of joining with fellow-congregants. It promises to be a special time. What (if anything) do you have planned? 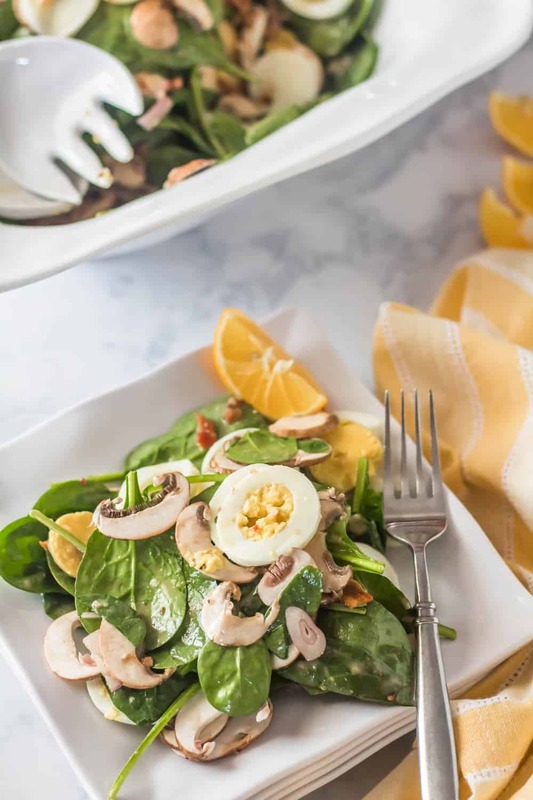 It's a classic, but it's not bland or boring... A Classic Spinach Salad with Honey Dijon Vinaigrette is nutrient and flavor packed with umami mushrooms, smoky bacon, and protein-rich hard-cooked egg. It's going to be perfect on your #SundaySupper table! 2 tablespoons fresh lemon juice I love Meyer lemon juice! Add all ingredients for the vinaigrette to a small blender. Process until very smooth. Check for seasoning and acidity level. If it's too acidic, add a bit more honey and/or olive oil. Add the spinach, mushrooms, and crumbled bacon to a large salad bowl. Toss with about half of the vinaigrette. Slice the hard-boiled eggs, and arrange over top of the salad. Drizzle with the remaining vinaigrette. Enjoy! You can substitute another good quality, smooth vinegar for the sherry vinegar such as champagne vinegar or good apple cider vinegar. Avoid harsh white vinegar or similar. The amount of spinach is totally up to you. We love spinach, and to serve four, I use most of a 10 ounce tub (so I specified 8 ounces). That may look like way too much, so back off a bit if you prefer less spinach. Macronutrients (approximation from MyFitnessPal.com): 247 calories; 9 g protein; 5 g carbohydrates; 22 g fat. Note: This vinaigrette is a generous amount per person. If you're counting calories, just cut back a bit! A tasty and hearty salad! The dressing is similar to one I make, though I use maple syrup rather than honey for the sweetness. It is hearty for sure, and always a welcome addition to the table. And I do love maple syrup in salad dressings too! This is one of my favorite salads! We used to make it often growing up. I will definitely try this honey dijon version. Yum! I think that some version of this classic spinach salad is older than I am! Your vinaigrette sounds wonderful! I’m going to try it on my next spinach salad!